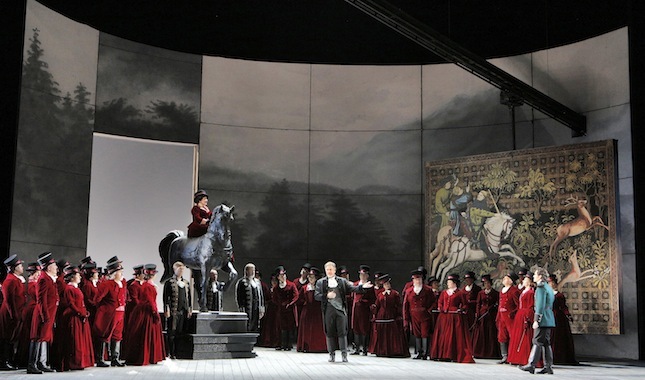 San Francisco Opera opened its 2015-16 season with the odd choice of Verdi’s Luisa Miller. What was odd about it, except for the out-of-date social issues that characterize Verdi in general, is that this Luisa Miller was somehow hampered, which is to say that the production lacked a certain fiery power and freshness ­– those qualities that bring people to the opera to begin with. Luisa Miller was simply well achieved. Part of the problem lies with Verdi, and how we approach him as a commentator on life, especially, our lives. Is it possible to accept opera simply as a beautifully wrought revelation of the past? The history that Luisa Miller traces – a late-Romantic struggle with class through the looking glass of romantic love – doesn’t quite resonate. For the most part, main stage opera’s fidelity to a 200-year period of performance composition and the concerns of that period seem to be receding faster than a middle-aged hairline. What then is the lure of these performances? How firmly does their connection to historical milieu hang in our consciousness? Certainly, the rising popularity of organizations like Opera Parallele and West Edge Opera indicate that Bay Area opera tastes may be taking a turn for the edge. Could their audiences be enough to fill the War Memorial Opera House? It doesn’t seem likely. SF Opera’s audience has long been conservative in outlook. The answers to these questions are murky at best. But with the imminent retirement of David Gockley, they seem to loom larger. Leah Crocetto, who sang the title role, has a truly lovely voice, with a clarity that makes her ideal for roles of innocence. It is achingly pure in the upper registers, and her delivery has a tenderness to it that is closer to the kind of character that Verdi hoped to portray than most. Luisa is no Violetta, no Tosca, no Isolde. She is the religiously good girl undone by her own sense of honor – a socially imposed sense of honor that traps her in its impossible demands and ensures her inevitable destruction. Closer to Gilda, but lacking her crucial closeted sophistication. What Crocetto lacks is sexuality, either earthy or transcendent. Something to make her admirer Rodolfo’s adoration plausible. This lack was complicated in the production by tenor Michael Fabiano, who sang Rodolfo and is – undeniably – a hunk. I mean hot. Seething sexuality, even while projecting a kind of innocent fervor. So Crocetto, by comparison, seemed detached. Fabiano also has that Italian opera singer resonance, which adds intensity to the tenor voice … even though he’s from Montclair, New Jersey. The two are surrounded by deep voices, and what wonderful voices they were Daniel Sumegi as the ambitious and greedy Count Walter, Andrea Silvestrelli as the conniving and lustful Wurm (seriously, Wurm? ), and Vitaliy Bilyy who sang Luisa’s well-intentioned but ineffectual father, Miller. Mezzo-soprano Ekaterina Semenchuk added her warm and earthy tones as Federica, Rodolfo’s childhood playmate and Luisa’s competition. I only wished she had made use of that riding crop when Rodolfo scorned her desire and her marital ambitions. There were parts of Francesca Zambello’s production that were fascinating and struck a deep chord visually: the color of the red velvet that the aristocracy wore, the medieval picture of the hunt that hung on the spar of the set, the use of shadows and silhouettes. This early set showed the combination of sources that Zambello is so good at mixing into a postmodern mélange. Even as it bounds a huge and open space. After the opening night performance, General Director David Gockley awarded Zambello the San Francisco Opera Medal, the highest honor bestowed by the Company to an artistic professional.